If you want evidence of what exclusivity deals can do for a streaming service, just look at the data below. 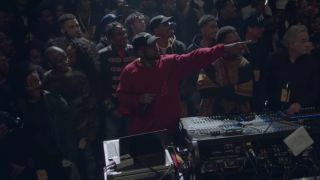 Tidal rocketed to the top of the iOS App Store after Kanye West announced that his latest album, The Life of Pablo, would stream exclusively on the service. As you can see from the data Tidal shared with us, the Jay Z-backed service rocketed from around 250 to number one in the US Apple App Store (Free, All Categories) in just a few hours. It didn't have quite the same impact in the UK, but it didn't do badly either, with the app sat at 13 at the time of writing. But let's not forget that Kanye hasn't acted alone in giving Tidal a much-needed boost. Rihanna's latest album Anti was recently released as a free download through the service, while Beyoncé's latest single Formation also dropped on Tidal on Feb 6. Shown below in the data from SensorTower, both Rihanna's and Beyoncé's releases pushed the service up significantly, from 600th to around 160th in the latter's case. Both were bigger spikes than The Life of Pablo caused, although Kanye had a shorter sprint to the finish line. Tidal also caught up with Spotify in daily app installs on February 12. None of this is a huge surprise given the anticipation surrounding these artists' music, and the drop between Rihanna's release and Beyoncé's shows that the service needs more than the odd exclusive to maintain momentum. Nonetheless, it's encouraging to some dramatic fluctuations. One criticism that has been aimed at Tidal is that its exclusive content and high subscription fees for the high-fidelity audio tier would only push users to pirate the music rather than using the service. Tidal's reception has been mixed to say the least. While these stats are encouraging news, they're short term. The service needs to do a lot more to win over users, unless it can keep pushing out big exclusives. While writing this story, Kanye did announce that his album will stay as a Tidal exclusive, and said it will "never be for sale". So there's that.